According to Vedic tradition, New Year begins with the Sun entering the first zodiac sign of Aries. In astrological terms, the Sun is said to get exalted here. This transit of the Sun into Aries is very powerful because during its northern journey (Uttarayana). The Sun reaches the peak of its strength in this zodiac sign. 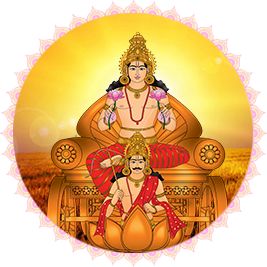 Vedic or Tamil New Year marks the beginning of the season of rejuvenation, fertility and growth. At this time of the year, the Sun, as the supreme source for light, energy and power, grows in power and vitality. Subsequently, it gives a boost to all aspects of life. As the nature around us celebrates colorful blossoms and fruitfulness, it is the right time to nurture a healthy body and strong immune system. The Sun can infuse pure life force into the physical existence. Its increased brilliance and gifts of prosperity facilitate expansion and proliferation of willpower, intelligence, wisdom, good fortune and success in all worldly affairs. The 1st day of the Tamil month of Chithirai or April 14 in the Gregorian calendar is celebrated as Vedic or Tamil New Year. People greet their friends and relatives with hearty wishes for their well-being and success. It is a common household practice to arrange a tray with a variety of fruits, betel leaves, areca nut, a piece of silver or gold jewelry, flowers and a small mirror, and view it immediately after waking up in the morning. This Vedic or Tamil New Year day is auspicious for a new beginning and for starting new projects or ventures. People rejoice this day by wearing new clothes and having happy times with their families. Many prefer to visit temples, so that they can step into the New Year with the blessings of the Divine. Many households worship Lakshmi, the Goddess of wealth, and Ganesha, the Lord of abundance and prosperity. As this astrological New Year begins at the instance of the Sun reaching the peak of his power, it is important to sync with his energies for receiving his blessings. As it represents the consciousness, it can teach to grow through the evolution of consciousness. Pray and meditate on the Sun. Chanting Gayatri mantra during this time can be very powerful as it can bring enlightenment. Tune into Sun’s energy and attain spiritual enlightenment.